Rebecca Warner (left) and Omagbitse Omagbemi explore the space around them. Photo by Ian Douglas. It’s no secret that dance and architecture are inextricably linked. Dance relies on performance spaces in order to exist in the public record, and religious leaders, royal families, and city planners alike have spent years (and millions of dollars) designing spaces in which to best display dance. 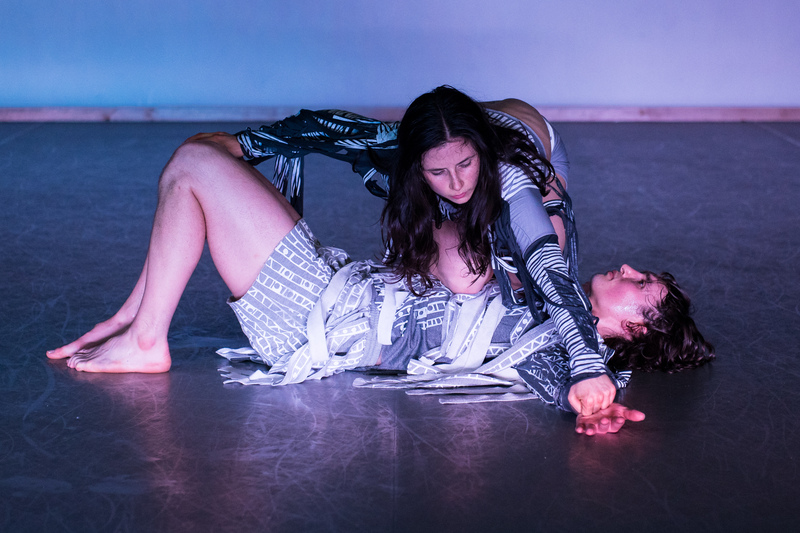 In terms of contemporary Western concert dances, there are, generally speaking, two categories of venues for performance: theaters and “unconventional” dance spaces (a.k.a. every other space that is not a designated theater). Not surprisingly, the use of these “unconventional” spaces – factories, parks, subway cars – has come to represent dances and dance structures that are on the cusp of newness, too cool to conform to the stuffy theaters of yesteryear (or yester-century). 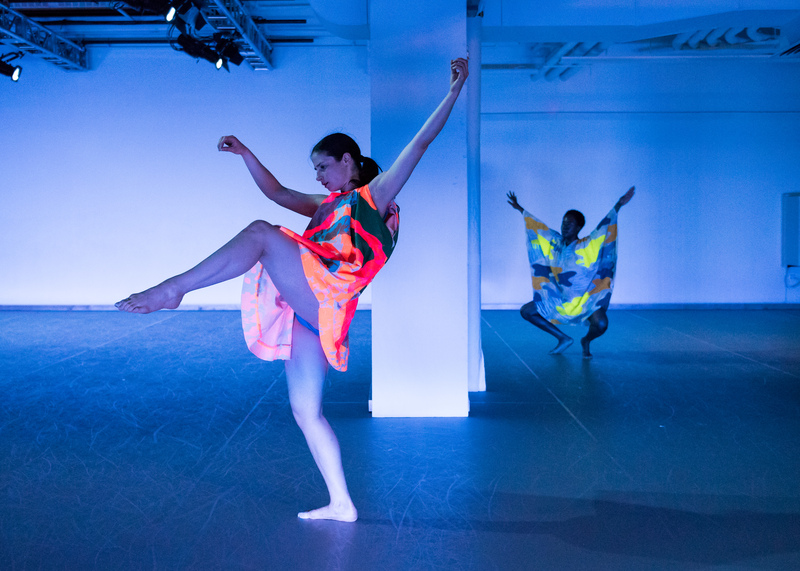 Discussions of financial access aside, one might look at this divide as a question of “ready-made space” versus “space in the making” – some dances are defined by the spaces they occupy, while others use changing contexts (i.e. occupants) to transform a space. Michael Ingle stretches out in the opening section of “Ruptured Horizon.” Photo by Ian Douglas. 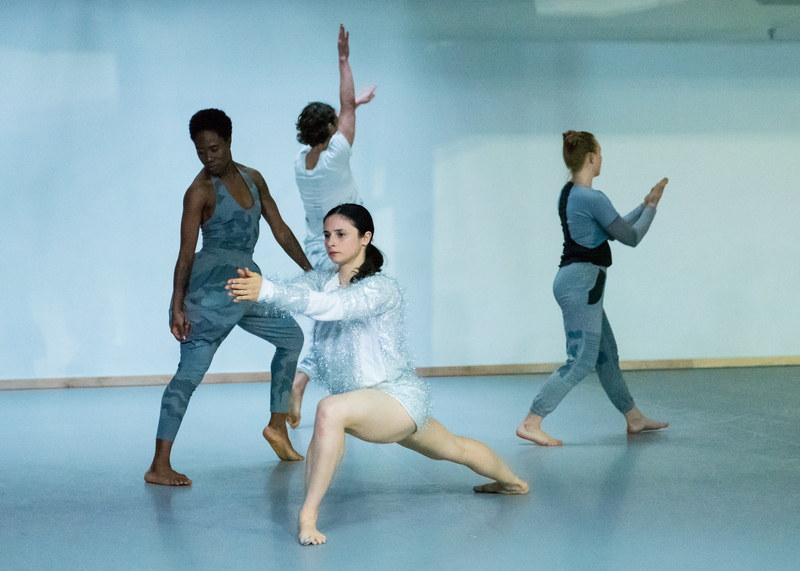 And then there is Ruptured Horizon, a new dance work by Brooklyn-based choreographer Anna Sperber that was recently performed at Gibney Dance’s Agnes Varis Performance Center (a venue that uses the fitting motto “Making Space for Dance”). Sperber skirts the line between ready-made and in-process spatial relationships by the use of another visual component that can be described with this dichotomy: light. Utilizing the advantageously-placed skylight in Gibney’s Studio C as her main source of illumination, Sperber and her cast construct a piece that is both at one with nature and fiercely independent, discovering a habitat all their own. 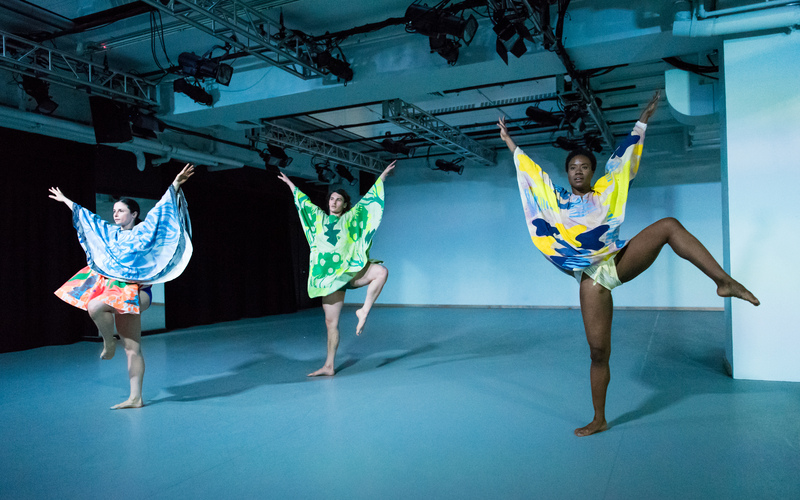 As the four dancers – Alice MacDonald, Michael Ingle, Omagbitse Omagbemi, and Rebecca Warner – trickle into the room, their focus is internal: what is this body of mine, and what can it do? Though each dancer eventually falls into a distinct movement character, Omagbitse Omagbemi, with her long limbs and graceful transitions between precarious positions, stands out. Even when she turns away from the audience, she can still express her exploration through the musculature of her back. Warner, the last to enter, is the odd one out. The cast of “Ruptured Horizon” explores as individuals. Photo by Ian Douglas. Dressed in a sparkling silver romper, she darts between the other three dancers, but they don’t seem to take much notice. She often stops to pause in a wide-legged, triangular stance, like the gnomon on a sundial. As the natural light from overhead begins to wane, Warner is both a reminder of time’s existence and a warning of its passage. Clothing changes break the piece into three sections. The first section’s camouflage sweats give way to bright, swirling ponchos, introduced by Warner as she repeatedly tries to turn the upstage wall into a partner. 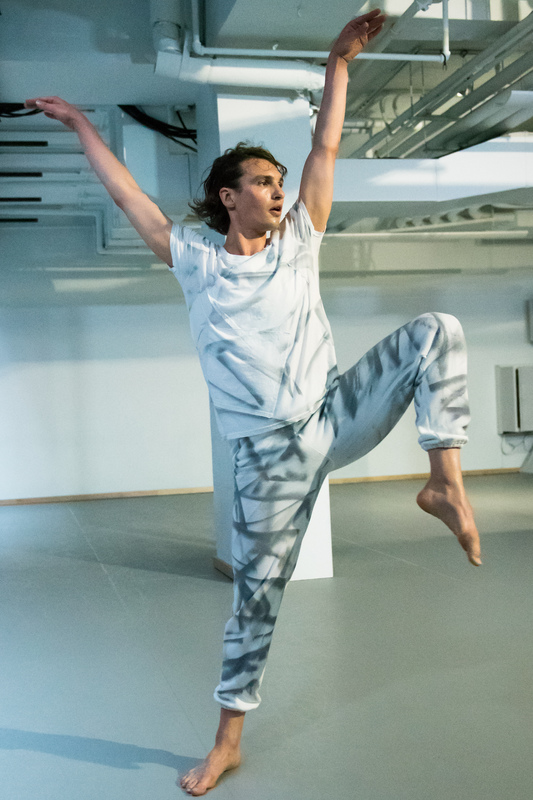 The second section is the most intriguing, in part because Christian Joy’s costumes for this section resonate best with Sperber’s suggestion of the dance space as a cosmic fantasy. If the first segment was an exploration of physical movement, the second is an exploration of the celestial. When MacDonald enters the space in her new orange tunic, she lays down on the ground and carefully arranges the fabric in a perfect circle around her – the setting sun. Once MacDonald stands, Warner moves her dance around MacDonald, orbiting her like the Earth around the Sun. Warner dances with the upstage wall. Photo by Ian Douglas. Up until now, much of the piece has focused on the dancers as separate entities, but here Sperber explores synchronicity. A unison trio for Warner, Ingle, and Omagbemi stands out; perhaps the planets are aligned. The electronically magnified blips from Jessica Pavone’s violin become more persistent (she’s stationed off stage, but in sight), like sonar signals increasing in frequency as the target comes into focus. The natural light is fading fast, and colored stage lights start to infiltrate the space. An architectural support beam, which often impedes the audience’s total view of the dance, is suddenly lit like a monolith, a pillar of light in a darkening sky. Soon, Ingle uses this “natural” feature to support his extended handstand balance, and the room starts to dance. When curtains are drawn back to reveal the usual studio mirrors, the area doubles to suggest a vast, open landscape. Here, indeed, is space-in-the-making, a fluctuation between the exploration of normal bodies in a room and the desire to imitate the grander perfection of Nature with a capital “N”. L-R: Warner, Ingle, and Omagbemi perform a unison trio. Photo by Ian Douglas. There is less exploration in the third section, but there is another costume change – fringe layers for Ingle and Omagbemi and makeshift leotards for MacDonald and Warner. Mixing sleek fits with wildly waving strips of fabric reveals how movement can reverberate past fingertips and toes. As the piece winds down, its direction becomes less clear. Movements are alternately soft, swift, aggressive, or indirect (brush up on your effort graph – the last ten minutes of the piece would be an LMA‘s student’s dream to analyze). When Ingle suddenly catches Warner in an upside-down pose, we realize that this is the first time the dancers have touched, and worlds have collided. As the piece ends and Ingle and Warner lay side by side under the skylight, they are out in a backyard at dusk, gazing up at the stars. Too bad this is New York City, where real starlight is hard to come by. Warner and Ingle (lying down) share a quiet moment as the piece ends. Photo by Ian Douglas.